Real estate signs are essential for advertising your open houses, listings, and building brand awareness. We looked at the most popular options and rising stars and decided to review Dee Sign, Oakley, and Build a Sign. These companies covered the range for agents and brokerages in terms of pricing and features. Read on for our comparison and review of these three options, as well as our top recommendations. We chose Dee Sign as the best real estate signs company for agents and brokerages because of their multiple shipping locations, low pricing and wide variety of sign materials to choose from. They’ve also been in business for more than 40 years and are still family owned and operated. Dee Sign has great pricing for the majority of the sign products they offer. They are generally cheaper or comparable to any sign company we looked at. When they do come in slightly more expensive as they do with the aluminum sign panels mentioned in the table, it’s because they offer a higher quality product and include design services in the price. Dee Sign was the only real estate sign company we looked at that has multiple shipping locations. They have several facilities on the West Coast, as well as a facility in Ohio. That means faster shipping times for the West Coast as well as the Midwest and East Coast. Dee Sign offers real estate signs in a dizzying array of materials to suit every budget and every area of the country. 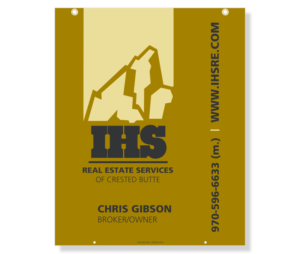 This is important as heat, rain, cold, and snow can all affect real estate signs differently. Aesthetics and longevity also play a role here. Check out their video on which sign materials work best for each region below. Very useful! They also have other great videos explaining installation and other helpful topics on their website. Even though they are one of the largest players in the real estate sign market, Dee Sign is still a family owned and operated company. If this matters to you (it should) Dee Sign should be your first call. Oakley Signs offered templates for the largest number of real estate brokerages and franchises. For many Realtors, a simple template will get the job done. If you just want quick, signs that already fit your brand, then Oakley Signs may be right for you. Oakley came at a lower price than the other two companies for sign panels at $39.93 and feather flags at $104, but at $89.42 their colonial posts were significantly more expensive than either Dee Sign or Build A Sign. This put them at the highest price for our sample order at $1813.50. Oakley is significantly more expensive for colonial posts and has a slightly less diverse selection of sign materials than Dee Sign. Build a Sign had relatively low prices for our sample order (10 yard sign colonial posts, 10 30”x24” aluminum sign panels, 5 open house feather flags), high ratings on Google Trusted Stores, and online sign designer. The only real drawbacks with Build A Sign is that they are a generalist sign company rather than a real estate-specific company. While you can still very easily get great signs for a great price on Build A Sign, they don’t yet have a large number of built in franchise stores offering sign templates for popular brokerages that Oakley and Dee Sign have. While this isn’t the end of the world, some agents and brokerages just want branded signs quickly and don’t want to worry about custom designs. Probably at the top of any newer agent or boutique broker/owner’s list, pricing was fairly similar across all companies. Slight variations in materials and sizes meant we would never be able to get an exact price match, but we feel our example order is representative of a first order for a newer agent or brokerage. Here’s how the three companies stacked up for pricing. Dee Sign: For our example order Dee Sign came in with the best price. However, it should be noted that Dee Sign’s open house feather flags are a full foot shorter (6’ vs 7’) than the feather flags offered by the other two companies. This had a big effect on pricing. Their aluminum sign panels were also a bit more expensive, but there are two good reasons for this: First, they are made of a thicker aluminum; .063 vs .040, and second, Dee Sign’s volume break starts at 12 units, For 12 units their price per unit for .040 sign panels is $52.50. Build a Sign doesn’t even offer .063, but Oakley charges $60.43 per unit for 12 .063 sign panels. For this sign configuration at least, Dee Sign is the clear winner. Oakley: At $1813.50 Oakley was the most expensive option for our test order. However, this was largely due to the expense of their colonial posts which came in around $20 more per unit than either Dee Sign or Build A Sign. Build a Sign came in at $1728.10, the second lowest price for our example order. Their pricing for colonial posts was on par with Dee Sign and their pricing for sign panels were close to Oakley, but their feather flags were significantly more expensive. Choosing the right materials for your real estate signs is always a toss up between cost and needs. More durable materials are always more expensive, but sometimes there are happy mediums that will work for most situations. Here’s how the three companies stacked up for variety of sign materials available. Here’s a quick video from Dee Sign explaining the relative merits of each of their sign materials. They also offer UV coatings (keeps signs from fading in the sun), eyelets and grommets in on standard locations. This helps reinforce the holes sings hang from. Oakley: Oakley has almost as many material options as Dee Sign. However, they don’t offer hardboard or powder coated aluminum. Here’s what they offer. Build a Sign, on the other hand, only offers aluminum, reflective aluminum, and corrugated plastic for their sign panels. While aluminum is seen by many as a truly universal material for outdoor signs because it doesn’t rust or get damaged by the sun, having more options would be nice. Dee Sign takes the edge here. Since your real estate signs have to be loaded into trucks and shipped to your location, the location of your sign company is crucial for fast shipping. Here’s where the three real estate sign companies we looked at are located. Dee Sign: Dee Sign has two locations, one in Southern California, and one in Ohio. That means that they can effectively cover the east and west coasts. Oakley: Oakley is located in Des Plaines, Illinois. Great for people in the Midwest or east coast, but may mean longer shipping times for agents working on the west coast. Build a Sign: Build A Sign is located in Austin, Texas. That means shipping to the Northeast or Northwest can take a long time. After shipping distance, turnaround time is another important factor for many Realtors. Of course anticipating future growth and ordering in well in advance is recommended, but this is not always possible. The only problem with measuring turnaround time accurately is that there are a lot of variables that can affect how long your order takes to finish. The size of the order, the materials used, and the season can all mean faster or slower turnaround times. Generally speaking, you should expect slightly longer turnaround times in the spring and summer when the market is busiest. In the fall and winter on the other hand, turnaround time should be faster. If you need a quick turnaround time, always confirm timing with the company before placing your order. Dee Sign: Dee Sign actually published their turnaround times for 2011 and their information shows that the vast majority of their orders shipped in 5 days or less, but their turnaround time does go down significantly in the summer where only a little over half of their orders shipped within 5 days. Almost 100% of their orders shipped within ten days regardless of the season. While this information is great to have, we wish Dee Sign would update their shipping information for 2016. Oakley: Oakley promises a turnaround time of six business days which is comparable with Dee Sign. However, they also acknowledge that shipping times will vary during the busy months of March through June. Even better, if your order ships later than their estimate, they will deduct 5% off the price of the portion of the order that’s late. Build a Sign: Build a Sign told us that most orders will ship in between two to twelve business days. Again, the size of the order and season will play a role in how quickly they can complete your order. Let’s face it, even though some Realtors will be perfectly content with stock templates, many will want totally custom designs. This is especially true for teams and boutique brokerages who will have more flexibility when it comes to branding. 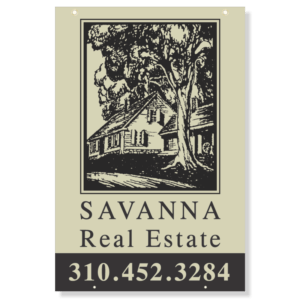 Custom signs are handled three ways by most real estate sign companies. Here’s how the three companies handled custom sign creation. Oakley: Oakley has a very basic online sign creator and also offers the ability to upload your own artwork as well as fully custom design your real estate sign. They charge $75 per hour for design services. Oakley also offers very helpful tips and tricks for DIY design and uploading. They have great advice for file size, image resolution, file formats and more. We wish more companies would publish specifications for sign artwork. Also like Dee Sign, Build A Sign offers in-house design services to help create your sign. However, they are not included in the sign price and start at $19.95 for basic design assistance. That means color matching, converting files, background removal etc. They also offer full custom layouts that start at $59.95. If you’re an agent or team working for a national franchise like Keller Williams, then it might make sense to go with a real estate sign company that supports your brokerage. That said, all this support really entails is offering templates that are on-brand and will work well for the franchise you work for. Since your sign will need to be customized with your name and contact information anyway, many Realtors opt for a fully custom sign design. This makes franchise support much less important. 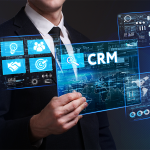 For boutique brokerages, it’s a moot point. Dee Sign: Dee Sign offers sign templates for all the major franchise brokerages. Keller Williams, Century 21, RE/Max, Coldwell Banker, and ERA. They also supply real estate signs for many other franchises and brokerages including Berkshire Hathaway, Prudential, and Sotheby’s. To see if your brokerage is on the list click here. Oakley: Oakley not only covers the major franchise brokerages, but goes a step further and includes local franchises (e.g. Keller Williams Honolulu) and dozens of more franchises. If you want a template ready to go then Oakley may be your best bet. For a full list of the brokerages Oakley Signs offers sign templates for, click here. 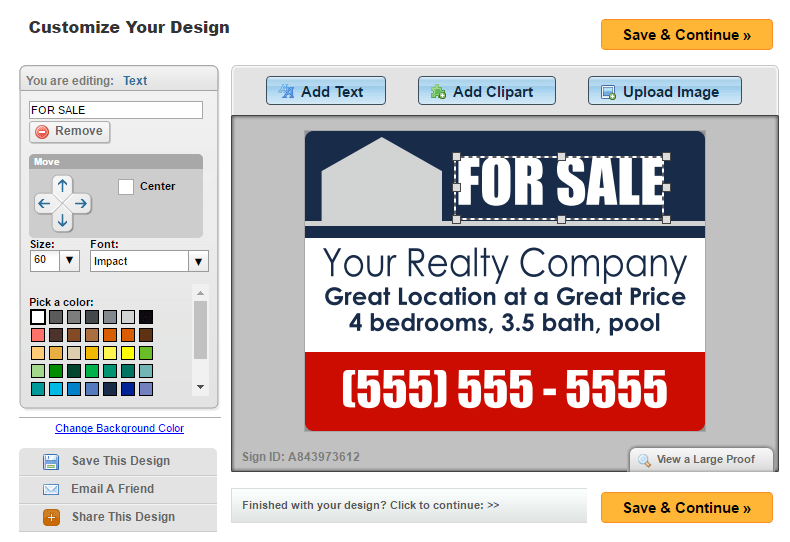 Build a Sign: Like Dee Sign, Build A Sign offers templates for the largest real estate franchises. They also offer real estate signs for Prudential, Berkshire Hathaway, Better Homes and Gardens, Exit, and Realty Executives. These are the only signs Build A Sign currently supports. While taking online reviews should be taken with a grain of salt, social proof is still a pretty good way to get a thumb in the air reading of a company. Here’s how the three companies did with online reviews. Dee Sign: Dee Sign has great reviews on Activerain, though it should be noted that there are less than 20 total reviews for the company there. On Yelp the reviews are far more mixed, with roughly half the reviews negative and half positive. Again, there are only 20 or so total reviews on Yelp so it is hard to make a judgement based on so few reviews when we’re talking about a large company that has been in business for more than 40 years.That said, we would have liked to see Dee Sign respond to their critics on Yelp. There was one customer in particular that appeared to have received two copies of the same sign that looked to be of very different quality. While there are a lot of variables here that might account for the differences, a response from Dee Sign would go a long way toward reassuring future customers. Oakley: Like Dee Sign, Oakley has great reviews on Activerain, albeit less than twenty of them in total. They also have very positive Yelp reviews… well, to be more accurate we should say Yelp review since they only have one. Build a Sign: Though they weren’t reviewed on Activerain, Build A Sign has more than 5,000 excellent reviews on Google Trusted Stores. The great thing about reviews on Google Trusted Stores is that only customers can leave reviews. That means faking reviews is extremely difficult. Since real estate signs are often a custom (not to mention expensive) purchase, great customer service is a must. Here’s how the three companies stacked up for customer service. While there are a lot of places to buy real estate signs, we chose Dee Sign as our top pick because of their multiple shipping locations, low pricing, wide variety of sign materials to choose from and the fact that they have been in business for more than 40 years. In your review process you made some really GREAT pathways to the Real Estate Community. The comparing of the three was again GREAT but the real comparison for the LOCAL Realtor should be how the THREE can be far better than the LOCAL printer (albeit better to buy local when possible for the local economy). I have had dealings with all three of your selected companies. And our satisfaction level leans to Build A Sign for creative genius and offered pricing. Now for the delivery aspect our experience once again leans to Build A Sign. Just a hint for better service/delivery/pricing use Build A Sign on EBAY and when you talk with Chris (E-Commerce guy) you will not go anywhere but Build a Sign. Again, all three were good selections to offer………..a little more weight should have been given to the Google Praise of Build a Sign. Thanks for the tip and glad you found the article useful. We found very nice signs (actually bundled together in a set of 4) on Amazon. They’re plastic not cheap paper Dollar Store ones. Not sure if I can put a link on here but if you just search for Open House Signs they are the ‘Amazon’s Choice’. The manufacturer is WDS. Have lasted for a year now and still hold up strong. Good buy. I think George Baker is referring to A-frame yard signs. The ones that are fold out versions of H-frames which do not require being pushed into the ground. I think more info is needed on what type of advertising. For instance, is it for advertising an open house? Or advertising a house for sale? Or advertising your business in general? It sounds like George is in a very restrictive town. So it will be easier to come up with solutions with first knowing what the restrictions are. H-frames instead of fold out A-frames; Walk the neighborhood (of the open house) and drop off flyers on the porch or doors the day before….and let them know you will be having refreshments available; Invest in Adopt-A-Highway road signs which shows your business name. Magnetic car sign; Feather flags at an open house; Business cards and flyers placed in local businesses; Create your own news-letter event list flyer along with local business names around the letters border and leave those in businesses on a monthly basis; Find mixers or any type of events that will give you the chance to pass out business cards and let people know what you do; Pay to have a sponsorship banner placed in local community center-Veteran building-clubs, etc; Attend and supply refreshments and info at subdivision meetings. Some of these suggestions can also help you to obtain email addresses to allow you to start doing email marketing. Do you have any recommendations for advertising aside from, mailings, postcards, etc…in a town that does not allow for A Frame Boards?